are a serendipitous pairing! M97 The Owl at upper left is one of the larger planetary nebulae, and was formed when its dying central star began out-gassing. Discovered by Pierre Méchain in 1781, this glowing bubble of Hydrogen and Oxygen III is estimated to be 3 light-years in diameter, 2,600 ly distant, and only 6,000 years old. Lord Rosse is credited with giving it its common name- do you see the owl's face? Also discovered by Méchain, M108 at lower-right is a nearly edge-on SCbc barred spiral galaxy near the star Merak in the bowl of the Big Dipper. Its distance is estimated to be 45,000,000 ly from Earth, some 17,000 times the distance of The Owl. 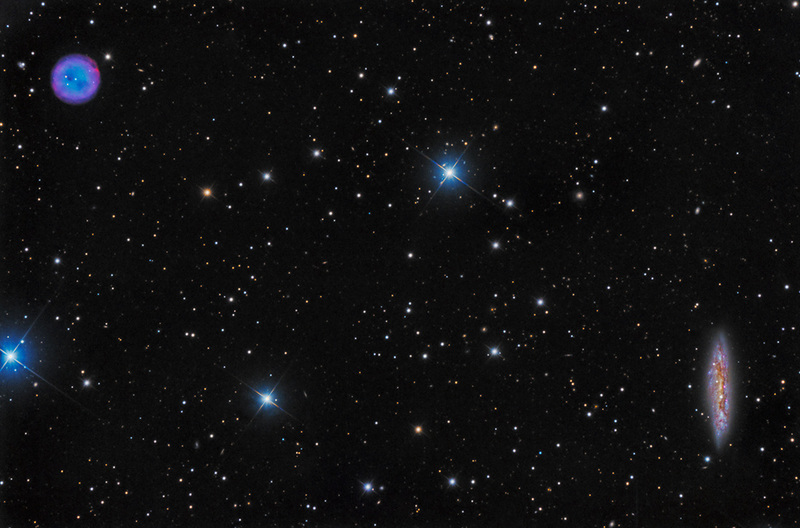 It is an isolated member of the Ursa Major Cluster of galaxies in the Virgo Supercluster. M108 appears to lack a central bulge though it has a few star-forming HII regions and is rich in dust lanes.